Reservations may be cancelled free of charge provided the Customer gives at least 72 Hours notice of the same prior to the check-in time for their reservation. Failure to notify the hostel by 2pm the previous day will incur a charge equal to the cost of the first night of the reservation and is non-refundable. The Terms and Conditions described herein, shall apply to the use of the facilities and services provided by Astor Hostels London. ‘Customer’ means a paying guest of Astor Hostels ‘Hostel’ means Astor Hostels as well as Astor Kensington, Astor Hyde Park, Astor Victoria, Astor Museum, Astor York; and ‘Rates’ means the prices payable for beds and/or rooms and (where applicable) other facilities offered by the Hostel. 1.2 Unless the context otherwise requires, each reference in these Terms and Conditions to: 1.2.1 “the Terms and Conditions” is a reference to these Terms and Conditions and each of the Schedules as amended or supplemented at the relevant time; 1.2.2 a Clause or sub-Clause is a reference to a Clause of these Terms and Conditions; and 1.3 Words imparting the singular shall include the plural and vice versa. 1.4 References to any gender shall include the other gender. 2. Bookings and Reservations 2.1 Customers may make reservations in advance through Hostel website, telephone, in person or through an OTA. 2.2 When making reservations, Customers will be required to provide identification information including, but not limited to, their name, address, contact telephone number, nationality and email address. 2.3 Payment details will be required for all reservations. Unless the reservation is expressly stated to require payment at the time of reservation, no payment will be taken until such times as indicated in Clause 3 below. 2.4 Reservations booked in advance do not constitute a legally binding contract between the Hostel and the Customer until the Hostel confirms the reservation with the Customer and provides the Customer with a booking reference. 2.5 Reservations may be changed by the Customer at any time prior to arrival (subject to the cancellation provisions set out in Clause 4 below). The Hostel will use all reasonable endeavors to accommodate any changes requested but gives no guarantee that all changes will be accommodated. 2.6 Reservations are not required. Customers may make bookings on arrival however the Hostel cannot guarantee the availability of rooms or other facilities for such bookings. 2.7 Customers may request additional nights at the Hostel at any time during their stay. The Hostel will use all reasonable endeavors to accommodate such requests. 4. Cancellations 4.1 Subject to sub-Clause 4.2 below, reservations may be cancelled without charge provided the Customer gives at least 72 Hours notice of the same prior to the check-in time for their reservation. Subject to the provisions of sub-Clause 3.6 above, any sums paid in advance to the Hostel shall be refunded to the Customer. 4.2 In the event that the Customer has paid in advance under the provisions of sub-Clause 3.4, no refunds shall be made in the event of cancellation. 4.3 Failure to provide the required notice of cancellation shall result in the Customer being charged for the first night’s accommodation at the Rate specified in their reservation. Any such payment shall be taken immediately using the payment details provided by the Customer when making their reservation. 4.3.1 Failure to provide the required notice of cancellation shall result in your subsequent nights, if any, being cancelled. So if you are delayed getting to us please call and we can try to amend your booking (subject to availability).4.4 The Hostel may, from time to time, cancel a reservation. In the event of such cancellation, the Customer shall be informed immediately and shall be offered a full refund of any and all sums paid. Where a refund is offered under this sub-Clause 4.4 only, the provisions of sub-clauses 3.5 and 4.2 pertaining to advance payments shall not apply and a refund shall be payable. 4.5 The Hostel may, from time to time, cancel a reservation if the reservation exceeds 14 concurrent days. 5. Check-in and Check-out 5.1 Check-in time at the Hostel is at 2pm. Check-in anytime after 2pm is permitted, there is a 24-hour reception. 5.2 Check-out time at the Hostel is 10.00am. Later check-out times may be possible by prior arrangement (and at the Hostel’s discretion), however in the absence of such prior arrangement, failure to check-out by 10.00am may result in the Customer being charged for an additional night’s accommodation at the standard applicable Rate. 5.3 In the event of a pre-arranged late check-out under sub-Clause 5.2 above, the Hostel shall charge the Customer for such additional time at an hourly rate, details of which shall be provided to the Customer upon their request for a late check-out time. 6. Hostel Rules 6.1 Valid photo identification in the form of a Government Issued Passport, Drivers License or European Identity Card is required at check-in. These are the only forms of ID deemed acceptable and failure to produce one of them will result in the guest being turned away without refund. 6.2 So as to remain a youth hostel, ALL guests must be between the ages of 18 and 40 to stay with us. 6.3 Customers are required to conduct themselves in a reasonable and responsible manner at all times when on Hostel property and must not act in any way, which may disturb other guests. Failure to adhere to this requirement may result in a Customer being asked to leave the Hostel in which event all sums due shall become immediately payable. 6.4 Smoking is not permitted in any indoor public areas of the Hostel. 6.5 Smoking is not permitted in any rooms. 6.6 Failure to adhere to the requirements of sub-Clause 6.3 shall result in the Customer being charged for any and all costs incurred by the Hostel in cleaning the room (including, but not limited to, fixtures, fittings and soft furnishings) and restoring it to a smoke-free environment. 6.7 No animals are allowed in the hostel with the exception of assistance dogs. If you have an assistance dog and would like to book to stay with us, in order for us to deal with your request effectively, please email mark@astorhostels.com for availability and prices. 6.8 Children under the age of 18 may not stay at the Hostel under any circumstances. The environment of our Hostels is not conducive to children and anyone booking with children will not be allowed to stay, and will not be issued with a refund. 6.9 Customers shall be charged for any and all damage caused by them to any Hostel property during their stay. 7. Food and Drink 7.1 Unless expressly indicated otherwise, food and drinks are not included in any Rates. 7.2 Customers with special dietary requirements are advised to inform the Hostel of the same in advance of their arrival. The Hostel will use all reasonable endeavours to accommodate such requirements and, where this is not possible, inform the Customer of the same. 7.3 Customers may not bring food and drink to their rooms, except water. Any food or drink found in the rooms will be confiscated by the cleaners and thrown away. 8. Disabled Customers 8.1 The Hostel fully complies with all laws from time to time in force regulating the treatment of, and provision for, disabled Customers. 8.2 Customers with any special requirements pertaining to a disability should inform the Hostel of the same prior to their arrival. 8.3 Please be aware, there are no lifts at any of the hostels, so those with a severe disability should consider this when making a reservation. 9. Limitation of Liability 9.1 To the fullest extent permissible by law, the Hostel’s liability for any loss or damage suffered by Customers shall be limited to that which arises out of the negligence of the Hostel’s employees, subcontractors or agents. 9.2 Notwithstanding sub-Clause 10.1 below, the Hostel shall not be liable for any indirect loss or damage which may be suffered by a Customer including, but not limited to, loss of income, loss of business, loss of profits, loss of opportunity, loss of anticipated savings, loss of data or loss of enjoyment. 9.3 Nothing in these Terms and Conditions purports to limit or exclude the Hostel’s liability for: 9.3.1 death or personal injury caused by the negligence of the Hostel, its employees, subcontractors or agents; 9.3.2 fraud or fraudulent misrepresentation; or 9.3.3 any other matter for which it would be illegal for the Hostel to limit or exclude its liability. 9.4 The hostel cannot be held liable for any loss of property due to negligence of the guest. Security is of paramount importance, and guests must take full responsibility for their personal belongings and valuables. 10. General 10.1 The Customer’s rights as a consumer under consumer protection legislation from time to time in force shall not be affected by these Terms and Conditions. 10.2 The Hostel may, from time to time, change these Terms and Conditions without notice, however it will use its reasonable endeavours to inform Customers as soon as is reasonably possible of any such changes. 11. Data Protection The Hostel will not share Customers’ personal data with any third parties for any reasons without the prior consent of the Customer concerned. Such data will only be collected, processed and held in accordance with the Hostel’s rights and obligations arising under the provisions and principles of the Data Protection Act 1998. By posting pictures, or any other posts on social media platforms, including but not limited to, Facebook, Twitter, Instagram, Youtube and Pinterest, you agree to allow Astor Hostels to use that material to promote the Astor Brand. 12. No Waiver No failure by the Hostel to enforce any provision in these Terms and Conditions shall constitute a waiver of the right to subsequently enforce that provision or any other provision of these Terms and Conditions. Such failure shall not be deemed to be a waiver of any preceding or subsequent breach and shall not constitute a continuing waiver. 13. Severance If any provision of these Terms and Conditions is held by any competent authority to be invalid or unenforceable in whole or in part the validity of the other provisions of these Terms and Conditions and the remainder of the provision in question shall not be affected. 14. Law and Jurisdiction 14.1 These Terms and Conditions (including any non-contractual matters and obligations arising therefrom or associated therewith) shall be governed by, and construed in accordance with, the laws of England and Wales. 14.2 Any dispute, controversy, proceedings or claim between the Parties relating to these Terms and Conditions (including any non-contractual matters and obligations arising therefrom or associated therewith) shall fall within the jurisdiction of the courts of England and Wales. 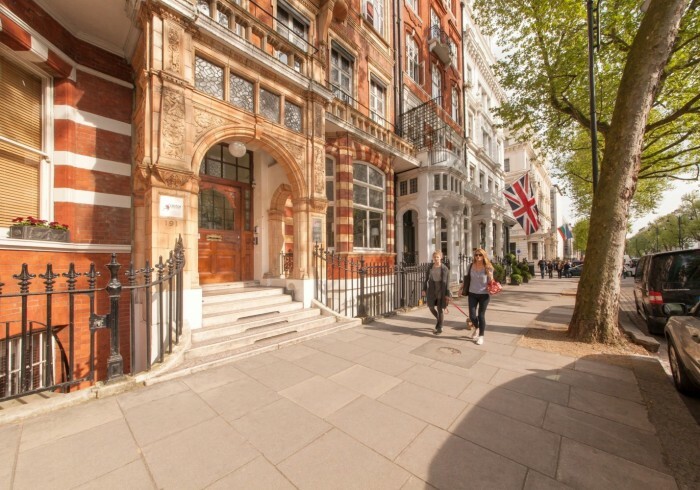 Located in the most beautiful and charming neighbourhood in London, Astor Hyde Park is one minute from Hyde Park and surrounded by some of London’s greatest museums including the Natural History Museum, Victoria & Albert and Science Museum. The hostel is a short walk from London’s best transport connections, including direct trains to Heathrow Airport and all of London’s attractions. If this weren’t enough the iconic pubs, excellent shopping, amazing restaurants and occasional celebrity sighting make it the perfect place to live while in London! Please note: VALID government issued ID required to stay with us, and ALL guests must be between 18-40 YEARS. At our amazing hostel you will have full access to: • Free Fast Wi-Fi throughout the building as well as Free PC Access • 24-hour reception for anything you may need (including late check-in/early check-out) • CCTV Security monitoring • Free security lockers for your valuables (laptops, cameras, phones, etc) • Free luggage storage available before check-in and after checkout (same day) • Laundry facilities available 24-hours. Hairdryers and ironing facilities free to use • All you can eat Breakfast for only £1.00 (All proceeds go to charity) • Wonderful fully equipped kitchens (large fridges available for food and drinks storage) • Dining room and common area to enjoy a meal or meet fellow travellers • Beautiful lounge area with comfy sofas and enormous projector screen for movies and sports! The moment you walk through our doors you become part of our family and we want you to have an incredible experience! We want every detail – from our super clean bathrooms and comfortable pillows to our unforgettable social events - to be perfect, giving you a London adventure that is 10 out of 10!